On May 10, the Siegfried Leadership Program™ held its second leadership development event for students in grades 8 through 12. 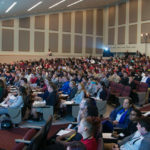 On a sunny Wednesday morning, more than 500 students and teachers from local schools made their way to the University of Delaware’s (UD’s) Clayton Hall for a half-day event designed to help them start — or continue — their journey toward developing strong individual leadership skills. Carlos Asarta, the Director for UD’s Center for Economic Education and Entrepreneurship and an Associate Professor of Economics at UD, opened the day with a brief, but powerful, presentation where he reminded attendees that the experiences you have in your life are what shapes you and prepares you for your future. With a warm welcome, he then turned the stage over to Rob Siegfried, CEO and Founder of The Siegfried Group, LLP and co-founder of the Siegfried Leadership Program™. Siegfried welcomed the students and expressed his appreciation for their attendance. “You’re here today because you’re eager to find success in your lives — which is a great thing,” he said. “And I’m here because I want to help you develop your leadership skills, create successful habits, and encourage you to think about what makes you happy. Because that’s how you find success. That’s how you achieve your goals.” Siegfried shared personal stories of his own journey from car washer to successful entrepreneur and role model, and encouraged the students to seriously think about their passion in life. In between sessions and during the various presentations, attendees wrote down their insights from the speakers, began to determine their current and future goals, and thought about what steps they should take next to make those goals a reality. Immediately following lunch, and before Siegfried closed the day, attendees were treated to two energizing performances: one by two graduating seniors from Newark High School, and one by an economics teacher and two of his students from Delaware Military Academy. 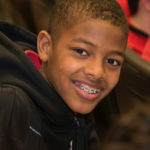 Students from the following schools attended the event: Brandywine, Mount Pleasant, Christiana, St. Ann School, Concord, Newark, St. Edmond’s, Positive Outcomes, Delaware Military Academy, Delaware Design Lab, and Nativity Prep.